The Great Hunt For My House Bourbon continues! I recently picked up a bottle of Eagle Rare 10 year, which lately has become better known as the younger and more-available version of the Buffalo Trace Antique Collection’s Eagle Rare 17, which is almost as difficult to acquire as Pappy Van Winkle bourbon. Funny how in this era of whisky obsession that the standard is eclipsed by the limited. Having been guilty of dismissing the 10 year as “not worth my time” in the past, I certainly can’t point fingers. I want several things in a house bourbon. I want it to be under $30 (preferably under $25). I want it to be regularly and widely available. I want it to be high enough quality to enjoy neat but also play nice with ice, bitters, and sugar to make a top-notch cocktail. 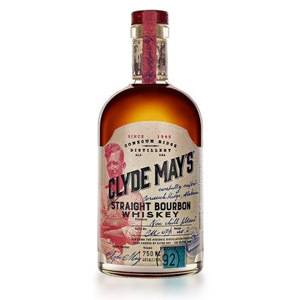 As I am still trying to find the perfect house bourbon for under $30, I figured I’d give this one a try, especially since it’s made by the same distillery as my current front-runner, Buffalo Trace. The Eagle Rare brand, originally a 101-proof Kentucky straight bourbon whiskey aged at least 10 years, began in 1975 under the ownership of the Seagram Company. It was sold to the Sazerac Company (later named Buffalo Trace) in 1989, which finally discontinued the 101-proof version in 2005. In its place, a 90 proof (45% ABV) 10 year-old single-barrel and a 90 proof 17 year-old became the standard Eagle Rare releases. The 17 year-old is part of the limited annual Buffalo Trace Antique Collection (BTAC), and is generally difficult to find. Recently during a label redesign, Eagle Rare’s “Single Barrel” designation was dropped and the age statement moved to the back of the label. According to this interesting account by Clay Risen in 2014, this is due to a change in the bottling procedure for Eagle Rare, which is still bottled one barrel at a time, but can no longer be guaranteed to contain liquid only from one barrel. Nose: Sweet and a little tart – orange peel and unripe cherries. Soft sweet corn, and a layer of caramel. Little or no spice. Palate: Silky smooth body, with the tart cherries up front, a bit of a burn, and then creamed corn, malted cereal, orange marmalade, and a hint of oak. Finish: Medium length, with just a ghost of the palate flavors. A little caramel, a little orange peel, then gone. With Water: Water seems to neither improve nor harm the whisky. Overall: A very nicely balanced nose, with both tart and sweet notes in harmony. I could wish for some hint of rye spice and a more robust finish. Still, I already prefer this to the similar and similarly-priced Elijah Craig 12. While the EJ12 has an edge in ABV and a more robust nose, Eagle Rare is miles ahead on the palate and is much more balanced. Eagle Rare 10 is also a very different animal than Buffalo Trace, despite being made at the same distillery from the same mash bill. ER10 has none of the Buffalo Trace sugar cane / vegetal complexity, and an entirely different fruit profile. While I would definitely drink this neat, with those orange and cherry notes it’s practically begging to be made into an Old Fashioned (no actual cherry and orange please, keep it subtle). Well, it’s official. 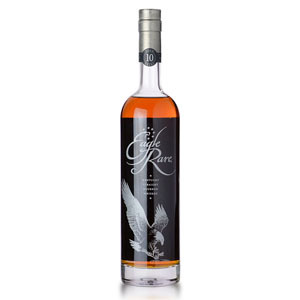 The only attribute that Eagle Rare 10 lacks on my “house bourbon” wishlist is consistency – as a Single Barrel release (or nearly so), it might vary from bottle to bottle. Still, I’ll take the individuality and chance of greatness over consistency any day. I now have a new house bourbon! If you haven’t given Eagle Rare 10 a chance because of Internet consensus that its big brother is the underdog of the Buffalo Trace Antique Collection, you really should take another look. Thanks for your review. I have yet to pull the trigger on a bottle of bourbon. Last year I tried a mini of Bulleit Bourbon and thought it was disgusting – too sweet and woody. I told myself then I would stick with Scotch. 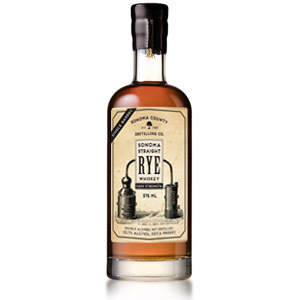 A few weeks ago I picked up a bottle of George Dickel Rye which I have really been enjoying. Eagle Rare is on my short list of bourbons to possibly finally try – included in that list is Four Roses Single Barrel which is what I will probably buy. Thanks again. Thanks for the review Nathan, this is definitely one that I have on my radar to try. Looking forward to your upcoming review of the Elijah Craig 12 too, since that is another one that I am interested in. I like my whisky neat, and typically find bourbons a bit too sweet for my taste. But I am always on the look out for something interesting. Keep up the good work! In that $26 usd price point, it’s hard to beat Elijah 12 and the Buffalo Trace. Another good one is the Evan Willians 12 single barrel 12. At $29, it’s hard to beat. The spices and the finish is great. I’ve not had the Eagle Rare – I’ll have to try it. I quite like Elijah Craig 12 (my house bourbon so-to-speak). I’m more of a Scotch guy, but for Scotch drinkers, I recommend Wild Turkey Rare Breed (easy to find), Elijah Craig Barrel Proof (hard to find). I also quite like Elmer T. Lee. The thing with bourbon is that we don’t always compare apples to apples against Scotch. Wild Turkey Rare Breed is like $40…yet considered expensive. Highland Park 12 (my house Scotch) is like $45-$50…and considered fairly priced. If we compare Scotch to Bourbon in the same price bracket, the quality is often much closer. Cheers! Thanks for the review. This is another occasional bourbon drinker who is fond of EC 12, but now I’ll have to pick up a bottle of ER 10 for comparison. I tried Eagle Rare for the first time tonight. I’m a fan of Buffalo Trace, so ER, being the big brother, should be better, right? Well, actually no. At least not for me. It’s super smooth and will surely appeal for anyone coming to whisky for the first time, but it lacks a good finish – almost as if the extra maturation (10 years) has given in one hand and taken away with other. The lovely, strong, spicy finish that’s so apparent with Buffalo Trace has been lost with ER. If smoothness is your primary goal, then ER certainly fits the bill, but I get all of the nice points of ER plus much better finish from Buffalo Trace. And at a lower price point too. I believe you have a lot of company with that opinion – I’ve heard and read (above in the comments as well!) that ER is “too smooth” and I agree, to a point. As I mentioned above, I find that for a house bourbon, I’m drawn to the simpler profile of ER10, whereas when I want a little kick or some complexity, I turn to Buffalo Trace. Both have vied for the “house bourbon” spot on my shelf, and both have merits (for me) which makes the choice difficult. I tried Eagle Rare for the second time last weekend courtesy of a good friend of mine. It’s good, in fact I would say it’s very good – especially at this price point, but there is a problem: you get most of the benefits for less money with Eagle Rare’s younger brother, Buffalo Trace. In fact, I might go so far as to suggest that Buffalo Trace is just a better bourbon regardless of the price difference. Personally, I think Eagle Rare is too smooth, especially at the finish where it tends to disappear too quickly for my liking. Buffalo Trace has many of the same favors, but with a nicer, more spicy finish. Some times the extra years of maturation take as much away as it adds? These two Bourbons are my current two contenders for “house bourbon” – my opinion is that sometimes (actually often) I prefer the smoother/slightly sweeter/slightly less complex approach of Eagle Rare 10. The vegetal (grassy) note in Buffalo Trace and the lower sweetness profile initially attracted me (I find a lot of bourbons too “sticky-sweet”), but I’ve found I like the balance in Eagle Rare slightly better. I would say that both bourbons are excellent choices, and these are just nitpicks. Eagle rare is in contention for your house bourbon?! Jeeze, I consider ER a “treat” bourbon. Casting aside what might be chalked up to financial disparities, ER seems to meet or better any sane persons criteria for a house bourbon. Especially considering that bourbons like Old Grandad (bottled in bond) are on the shelf for half the price. Not withstanding the the old adage (no accounting for taste) I suggest you acquaint yourself with the charms of the bottem shelf. This is one of the great advantages of being a burbon (and not a Scotch) drinker. I agree with you Kent. ER is a luxury splurge, not a daily pour for me too (typically mid-$30s for a fifth by me). I get more satisfaction out of finding lower priced diamonds in the rough than well known pricier choices. I have tried many fine bourbons and scotches in the past few years, but only for the experience. I too have enjoyed the OGD BIB, as well as the 114. My favorite everyday bourbon was the 1.75 of Evan Williams BIB I was getting for $30 until it was recently dropped from my local liquor store chain. 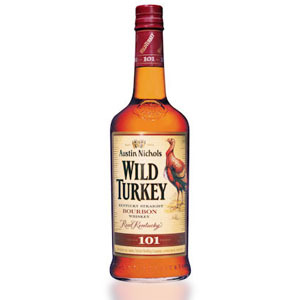 Wild Turkey 101 has taken its place in my cabinet of everyday bourbons (recently had for $30-$37/1.75). For a little sweeter bourbon, I enjoy Buffalo Trace. Actually I did a blind taste test with a couple of friends of BT vs ER10 yr old, and BT was preferred unanimously. My only reservation was that the ER had a better nose. I also like to look for the bargains, like the time I was at Target and found mispriced 4Roses small batch tagged at the yellow label price. I cleared the shelf. Lastly, for a modest price single malt scotch, I get Speyburn 10 year old. Decent aging, and the 86 proof is at least a little higher than the typical 80 proof of most entry level scotch. Won’t blow you away, but when you got a taste for the barley malt, it satisfies it. Oh yeah, and I get it for $50 a 1.75. Not exactly Jim Beam cheap (actually JB Black was my first adventure in bourbon, and wasn’t bad), but for a 10 yr old single malt, and compared to a lot of others going for $50 or more a fifth, it’s a bargain. I will continue to try the more expensive scotches and bourbons but only on special occasions. That way, they will taste special. Because even the premium spirits start to taste ordinary when you drink them every day. Totally agree, Jeff, about Evan Williams White and Turkey 101 (Wild Turkey works a little better for cocktails, but that’s what Rittenhouse is for — I kind of think the “toned down” Heaven Hill house style is perfect for higher rye mashes). For lower priced single malts, I sometimes find Glengoyne 10 close to the cost of Speyburn 10, and I definitely prefer it: more rounded, fuller bodied, darker fruits. I also recently tasted four lower-priced scotch blends, with interesting results: the new “Barrelhound” (made by the Chivas people), Black Bottle, Black Grouse, and Glasgow Blend (Compass Box). Only the last one really had the Islay taste, though a whisp of smoke could be found in the Black Bottle, and smoke was integrated in the Grouse old-school scotch style (and for me, successfully transformed the disarmingly gross jet fuel half of the standard grouse into something I wanted to drink). I also hadn’t realized before comparing it with the Barrelhound that (new) Black Bottle sneaks in American-style cola and cherry flavors. Low-cost tastings can be really engaging and instructive. My cabinet currently has 3 bourbons. #1 is the Eagle Rare 10 year, best everyday neat; a very close # 2 is Elijah Craig 12; and if I feel like a little ice, #3 is Four Roses single barrel. I’m definitely more of a Scotch and Rye guy than bourbon lover, but I tried ER 10 a few weeks ago and fell in love. I just polished off my first bottle tonight and will definitely be buying another. If I LOVE ER10, what else do you think I might enjoy in the bourbon category? I like EC 12, but not as much as this ER10! You could try Buffalo Trace (same distillery as Eagle Rare), but it’s not quite as good (and it’s cheaper). You would probably enjoy Four Roses (either the Single Barrel or the Small Batch). Cheers! Jason, give Makers Mark a try. Try Blanton’s. Even smoother than ER. Eagle rare 10 is a staple in my bar. I am stocking up as the 10 year age statement will soon be gone. EC12 and KC 9 YR are suffering the same fate. Wife just found ER10 1.75 L in Seattle, I’ll get a chance to try it Monday night!!! I really like Buffalo Trace as well…I really like low rye mash bill bourbons…. Tried this last month and I agree with your review. Very good stuff and great price point on top of it. 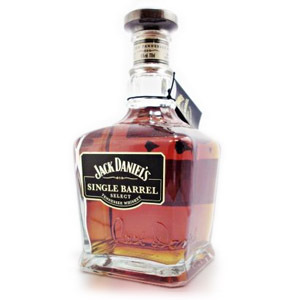 This is a great alternative if your budget doesn’t allow for higher priced bourbons/scotches. I prefer Blanton’s over this, but it’s also more expensive. After a long workday I went to a Nugget store to pick up a bottle of Balvenie DoubleWood 12 intending to treat myself/begin my foray into scotch whisky, but I balked at the $65 price tag and instead picked up an Eagle Rare 10 based on your review. And I have to say, I have absolutely zero regrets! I mean, I’ll probably still stare longingly at the Balvenie, but I’m very much in love with the Eagle Rare. I generally drink bourbon on the rocks, but this is so smooth and silky that I’ve been sipping it neat. Thank you for your introduction to a wonderful whiskey! Thanks for the note! See if you have a Total Wine & More store near you, they probably have better prices. Cheers! I have passed up eagle rare countless times over the years and never gave it a second thought because it was always in stock and nobody I know has ever tried it,now it is one of my favorites.i have a place that sells these for 29.99 and nobody buys it.I think of all the money I have spent over time tasting bottles I couldn’t even finish.I plan on loading up on these before it’s price migrates nothing like everything else. Just tried Eagle Rare and am not impressed. People talk about how smooth it is. I call it bland. I much prefer Elijah Craig, even with no age statement. It just tastes better to me. I think EC is a touch sweeter and is more complex. It’s bolder and bigger than Eagle Rare. It’s also about $8 a bottle cheaper here in Northern California. Too bad. I was looking for an alternative to Elijah Craig. I guess I’ll keep looking. I’m not sure what it is about this one. Eagle Rare gets rave reviews from just about everybody, but there’s something… I just can’t. Even by bourbon standards, it’s too, well, sweet! If you have recommendations for something completely opposite, please do. My favorite bourbon of all time might be Maker’s 46. My “second favorite” might be Buffalo Trace, which is cheaper and FAR less sweet than Eagle Rare. In fact, it was my house bourbon before I discovered that I like ER. Other prior favorites were Wild Turkey 101, anything from Weller (although it’s all hard to get these days), and I did indeed like the Maker’s 46 although I’m no fan of the basic Maker’s, and I think the 46 is a little pricey. Cheers!